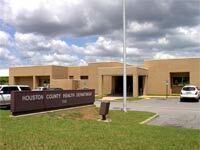 The Houston County Health Department offers clinical, environmental, and home health services to the public. As of February 1, 2019, the Houston County Health Department will no longer offer overseas travel vaccines. For a list of International Travel Clinics in Alabama that offer vaccines, visit Immunization. The Houston County Health Department conducted more than 10,000 home care visits in 2017. For details on this and other public health accomplishments and initiatives, see the 2017 Houston County Health Department Annual Report. Depending on your diagnosis, you could receive free monitoring equipment such as a glucometer, blood pressure monitor and/or a set of weight monitoring scales. A Registered Nurse will work with you and your doctor to achieve improved outcomes for your chronic disease. If you would like to participate in the program at no cost to you, or you would like information about this program, contact Lynn Goodson, RN, at (334) 678-2805 or 1-866-813-7636.